The aim of this research was to develop a simple model to investigate the effects of cell phone use on DNA and to evaluate a technology that may protect against these effects. DNA single-strand breaks were evaluated using the comet assay in hair follicle cells from twenty male human subjects ranging in age from 20 to 30 years, both before and after a 30 min exposure to radiation emitted from a cell phone, either with or without a built-in protective technology enabled. All individuals exposed to cell phone radiation with the protective technology disabled showed significantly higher levels of hair follicle cell DNA single-strand breaks. However, individuals, who were exposed to the radiation with the protective technology enabled, showed no significant increase in strand breaks in their hair follicle cells. Radiation from cell phones increased levels of DNA damage in hair follicle cells, and the technology investigated attenuated this effect. Radiofrequency radiation (RFR) is used in wireless communication, particularly in cell phone technology. When a cell phone is used, a majority of the energy emitted by its antenna is absorbed by the hand and head of the user, which is similar, albeit at a much lower level, to energy absorbed when food is cooked in a microwave oven. However, the effect is of a chronic nature, i.e., over years of daily cell phone use. Usage of cell phones is on the rise, as are concerns about the health effects of exposure to RFR emitted by the phones. Previous research has shown that cell phone radiation may have detrimental effects on human health. Though some studies have been inconclusive or have shown no effects, the research as a whole has indicated that cell phone radiation can pose a significant health risk . In 2011, the World Health Organization’s International Agency for Research on Cancer (IARC) classified cell phone radiation as a possible human carcinogen (Group 2B) mainly due to the association between cell phone usage and increased risk of certain types of brain cancer. Recently, Motawi et al. have shown significant neuronal damage in young and old rats after just 60 days of daily (two hours per day) exposure to cell phone radiation. A recent research in rats has shown that exposure to cell phone radiation had tumor promoting effects  in lung, liver, and lymphatic cells. Some research indicated cell phone radiation may have effects on future generations: a recent study linked high levels of cell phone usage, measured by duration and specific absorption rate (SAR) levels, to spontaneous abortions , and Kesari and Behari  found a significant effect of daily cell phone usage on biomarkers of male reproductive health. Many reports have been published on the possible genetic effects of low-intensity RFR. DNA damage has been a significant area of investigation. Lai and Singh  first reported that DNA single-strand breaks, a common form of DNA damage, were higher in brain cells of rats after exposure to RFR. More recently, Çam and Seyhan  reported that short-term exposure to cell phone radiation caused an increase in DNA single-strand breaks in hair follicle cells of the user. The goal of this research was to test a simple model to investigate the genetic effects of cell phone use and to test the possible modulation of these effects by software installed in the phone. This involved measurement of DNA single-strand breaks in hair follicle cells of human subjects after using cell phone. The ‘comet assay’ was used to assess DNA single strand breaks and alkali labile sites [8, 9]. This model was then used to test a cell phone protection-application being developed by N8 State/N8 Technology, LLC, called the N8 State Software App (https://n8state.com/). The app can be loaded into a cell phone. It is supposed to modulate the RFR emitted by the phone and lessen its biological effects. The present research is a first attempt to investigate the mechanism of action of the technology. All chemicals were purchased from Sigma Aldrich Chemical Company (St. Louis, MO, USA) unless stated otherwise. Twenty male human subjects between 20 and 30 years of age participated in this study. The mean age was 25 years. All subjects were pre-screened with a questionnaire to ensure that they were healthy and had no indicators for increased DNA damage (such as drug, tobacco use, and recent ionizing radiation exposure). The study was reviewed and approved by the University of Washington’s Institution Review Board (Human Subjects Division). All subjects went through the process of informed consent and signed consent forms prior to participation in the study. A Samsung Galaxy Note 4 cellular phone (Samsung, Seoul, South Korea) with a FCC-certified head average SAR of 0.10 W/kg operating on an AT&T GSM (Global System for Mobile) network at 850 MHz was used in the study. N8 State Software App (protection application) was installed into the phone. The phone was first connected (by calling) to another phone in the lab and then it was activated by a speaker attached to the mouth piece that played the same section of an audiobook.mp3 file . Each subject was asked to hold the phone on one side of his head for 30 min as if he was carrying out a normal conversation. However, subjects were not asked to speak. The side of the head (left or right side) was determined by the subject’s normal habit of phone use. Immediately before the phone was switched on, each subject was asked to hold the phone and five to ten hairs were plucked, using a pair of hair forceps, from a location on the subject’s head close to the base of the phone antenna. The phone was then switched on, connected, and activated by feeding the audio signal to the mouth piece. Immediately after exposure, five to ten hairs were again plucked from the same location on the subject’s head. The protection application was disabled for the ‘exposure group’ (10 subjects) and enabled for the ‘protected group’ (10 subjects). After the hairs were plucked, they were immediately immersed in a microfuge tube containing 750 µL of RPMI-1640 media with serum (Life Technologies, Grand Island, NY, USA). In order to process the pre- and post-exposure hairs at the same time under the same electrophoresis conditions, the microfuge tube containing the pre-exposure hairs was put on ice for 30 min to prevent any DNA damage or repair in hair follicular cells. We have previously shown that 30 min storage on ice does not produce any significant change in DNA damage levels in cells . Processing both samples from the same individual at the same time enhanced the reliability of the study. This allows samples to be handled identically during processing. Using the forceps, hairs were transferred to a microfuge tube that contained 750 µL of collagenase (1 mg/mL) to dissociate the cells from hair follicles. They were then incubated for 15 min at 37°C with 5% CO2 in air and 100% humidity. During the incubation, the tube was vortexed at the 5 and 10 min time points for more efficient action of the collagenase. Then, 750 µL of RPMI-1640 medium with 10% fetal bovine serum was added to the tubes to inactivate the collagenase. Hairs were then taken out using a pair of forceps. The microfuge tube was then centrifuged for 5 min at 5000x g (Sorvall Microspin, Model 245, Thermo Scientific, Waltham, MA, USA). The supernatant was discarded and the cell pellet was re-suspended in 10 µL of medium. DNA damage in hair root cells was assayed by the alkaline comet assay. Approximately 200 to 1000 hair follicular cells, mostly epithelial (>95%) in origin, can be obtained from a single hair follicle. A small number of fibroblast like cells and endothelial cells may be present. Only less than 0.1 % of the cells are melanocytes. Comet assay for assessment of DNA single-strand breaks was performed on this mixed population of cells. Microgels were prepared on custom-made slides (MGE Slides, Mac & Sons Specialty Glass, Titusville, FL, USA). These slides provide a clear, non-frosted area in the center (1×3 cm) for low background visualization of DNA and a frosted area around for firm attachment of agarose. The first layer of microgel was made by putting 100 mL of 0.5%, 1:3 high-resolution agarose (Amresco, Solon, OH, USA) in the center of a slide and covering by a 24 x 50 mm cover glass. After cooling the slide for 1 min on ice, the cover glass was removed and the microgel was air dried at room temperature. On top of the dried layer, the first wet microgel layer was made using 250 mL of 0.7%, 1:3 high-resolution agarose. Ten microliters of the hair follicular cell suspension were mixed with 50 mL of 0.7%, 1:3 high-resolution agarose. Fifty microliters of this mixture was layered onto the pre-coated slide to make a second layer of microgel. After removing the cover glass, another layer of 250 mL of 0.7% agarose was layered on top of the cell layer, and then covered with a cover glass. This thicker third layer helped to prevent escape of DNA during lysis and electrophoresis. After removing the cover glass, slides were incubated for 1 h in a lysing solution (pre-warmed to 37°C) having 1.25 M NaCl, 0.01% sodium lauryl sarcosine, 50 mM tetra-sodium EDTA, 10 mM Tris, at pH 10 and containing fresh reduced glutathione (1 mg/mL) and proteinase K (0.5mg/mL) (Amresco, Solon, OH, USA). They were then placed on a horizontal electrophoretic unit (Ellard Instruments, Monroe, WA, USA) modified to allow electrical input from a power supply to both ends of a positive and negative electrode. The unit was filled with a liter of a solution containing 300 mM sodium hydroxide, 1 mM EDTA (ethylene diamine tetra acetic acid), and 0.2% DMSO. After 20 min of DNA unwinding and equilibrium of the microgel in the solution, electrophoresis (18 volts, 480 mA) and solution recirculation (100 ml/min) was started simultaneously for 20 min. Slides were then immersed in a neutralizing/DNA precipitating solution of CTAB (cetyl tri-methyl ammonium bromide) for 10 min and this step was repeated once more and the slides were immersed in a mixture of 75% ethanol and 25% Tris (tris(hydroxymethyl)aminomethane hydrochloride) for 10 min. This step was repeated twice more. Slides were then air-dried. One hundred microliters of Yellow-Orange Yellow-Orange-1 (YOYO-1, Thermo-Fischer Scientific, Grand Island, NY, USA) stain were applied in two rows of 10 small, equally spaced droplets over the clear window area of a slide (to minimize variation in the intensity of stained DNA) and covered with a cover glass. Images of the comets at 400× magnification were captured using a charge-coupled device (CCD) camera GW 525 EX (Genwac Inc., Orangeburg, New York, USA) attached to an epifluorescence microscope (DM LB Leica Microsystems GmbH, Wetzlar, Germany) with an excitation filter of 490 nm, a 500 nm dichroic filter, and an emission filter of 515 nm. One hundred hair follicle cells from each slide were analyzed using the VisComet image analysis software (Impuls Imaging GmbH, Türkheim, Germany). Comet extent, tail moment, and integrated intensity were analyzed and used as indices of DNA strand breaks. Comet extent is the distance from the leading edge to the trailing edge of the tail of the comet. The tail moment is the product of the tail length and the percent of nuclear DNA contained in the tail. Integrated intensity is a parameter used to measure changes in length, breadth, and intensity of nuclear DNA due to damage. These parameters have been used previously and are considered acceptable and reliable assessments of DNA damage. Only cells with intact nuclei were scored and highly damaged cells (comet extent greater than 625 pixels) were excluded by setting a strict maximum limit in the image analysis program. This ensured that apoptotic, necrotic, pre-necrotic, or pre-apoptotic cells were not included in the analysis. Average of the scores from 100 cells from a subject was calculated for each parameter and used in data analysis. Statistical analysis was performed using the GraphPad Prism 6.03 (La Jolla, CA, USA). Changes in DNA damage before and after cell phone use were compared using the paired t-test. A difference at P < 0.05 was considered statistically significant. DNA damage levels before and after cell phone use in the groups with the protection application (“app”) disabled and enabled are presented in Figures 1 and 2, respectively. Several parameters were used to quantify DNA damage: comet extent, mean tail moment, and tail integrated intensity. Means were calculated from 100 cells from each sample. Data showed that 30 min of cell phone radiation exposure significantly increased (by 20-50%) DNA single-strand breaks in hair follicle cells of subjects when the protection application was disabled. With the protection application enabled, the increase in DNA breaks was blocked, and actually, there was a slight significant decrease (10-40%) in breaks in hair follicle cells. An acute exposure (30 min) to cell phone radiation from a simulated transmission increased DNA damage in human hair follicle cells. Use of the N8 State protection application during cell phone operation attenuated the DNA-damaging effect of the radiation. There was a significant increase in hair follicle cell DNA damage levels in all three parameters measured after cell phone usage in human subjects who used the phone with the protection application disabled, whereas a significant reduction in DNA damage was observed in the cells of subjects who used the phone with the protection application enabled. Our results support the conclusion of Çam and Seyhan  that radiation from cell phones increased levels of DNA damage in human hair follicle cells. Skin temperature underneath a cell phone in use could increase by 2-3 oC which is mainly caused by heat conduction from the handset instead of from the radiofrequency energy emitted by the phone [12-14]. However, such an increase in temperature has been shown not to significantly affect DNA strand breaks in cells . Thus, the increase in DNA strand break in hair follicle cells observed after cell phone use was probably not caused by heating and was likely a “nonthermal” effect of the radiation. The present experimental procedure provides a relatively noninvasive and simple approach to evaluate the biological and possible health effects and mechanisms of action of cell phone radiation on humans. In addition to DNA damage, other cellular processes, such as metabolic and enzymatic changes and oxidative processes can be investigated in human subjects using this procedure. One novel finding is a significant decrease in DNA strand breaks after exposure to 30 min of cell phone radiation in the group that had the protection application enabled compared with baseline levels of DNA damage. While there may be several reasons for this phenomenon, we speculate that the technology may modulate the radiation such that DNA may undergo only a minor insult. This minor insult may trigger DNA ligase I activity which, in turn, over-repairs damage even beyond the baseline level. DNA ligase I activation  is essential to repair of most of the more than one million DNA lesions per day per cell that happen normally in every individual due to environmental insults or failure of DNA repair enzymes . Over-expression of DNA ligases in response to oxidative stress has been previously reported . Further studies on the induction of ligases in RFR-induced DNA damage with and without the protective technology may provide information on the mechanisms. This is a first attempt to study the effectiveness of the N8 State Software App in reversing the biological effects of cell phone radiation. Different makes of cell phone basically are emitting the same type of radiation. The amount of energy deposited in the head depends on the configuration of the phone antenna. Thus, the protective technology should be able to reverse the effect of different makes of cell phones. However, more research has to be carried out to better understand its effectiveness and mechanism of the technology, particularly, on different biological effects of cell phone radiation. The authors would like to acknowledge Dr. Henry Lai for his invaluable advice and support. This work was financially supported by N8 State Technology LLC, which had no oversight or right to review the research summarized here. Carpenter DO (2013) Human disease resulting from exposure to electromagnetic fields. Rev Environ Health 28,159-172. Motawi TK, Darwish HA, Moustafa YM, Labib MM (2014) Biochemical modifications and neuronal damage in brain of young and adult rats after long-term exposure to mobile phone radiations. Cell Biochem Biophys. 70, 845-855. Lerchl A. Klose M, Grote K, Wilhelm AF, Spathmann O, Fiedler T, Streckert J, Hansen V, Clemens M (2015) Tumor promotion by exposure to radiofrequency electromagnetic fields below exposure limits for humans. Biochem Biophys Res Commun. 459, 585-590. Mahmoudabadi FS, Ziaei S, Firoozabadi M, Kazemnejad A (2015) Use of mobile phone during pregnancy and the risk of spontaneous abortion. J Environ Health Sci Eng. 13, 34. Kesari KK and Behari J (2012) Evidence for mobile phone radiation exposure effects on reproductive pattern of male rats: role of ROS. Electromagn Biol Med. 31, 213-222. Lai H and Singh NP (1995) Acute low-intensity microwave exposure increases DNA single-strand breaks in rat brain cells. Bioelectromagnetics 16, 207-210. Çam ST and Seyhan N. (2012) Single-strand DNA breaks in human hair root cells exposed to mobile phone radiation. Int J Radiat Biol. 88,420-424. Glei M, Schneider T, Schlörmann W (2016) Comet assay: an essential tool in toxicological research. Arch Toxicol. 90, 2315-2336. Singh NP (2016) The comet assay: Reflections on its development, evolution and applications. Mutat Res Rev Mutat Res. 767, 23-30. Anderson V and Rowley J (2007) Measurements of skin surface temperature during mobile phone use. Bioelectromagnetics 28,159-162. Paredi P, Kharitonov SA, Hanazawa T, Barnes PJ (2001) Local vasodilator response to mobile phones. Laryngoscope 111,159-162. Straume A, Oftedal G, Johnsson A (2005) Skin temperature increase caused by a mobile phone: a methodological infrared camera study. Bioelectromagnetics 26,510-519. Mitchel RE and Birnboim HC (1985) Triggering of DNA strand breaks by 45 degrees C hyperthermia and its influence on the repair of gamma-radiation damage in human white blood cells. Cancer Res. 45, 2040-2045. Taylor MR, Conrad JA, Wahl D, O’Brien PJ (2011) Kinetic mechanism of human DNA ligase I reveals magnesium-dependent changes in the rate-limiting step that compromise ligation efficiency. J Biol Chem. 286, 23054-23062. Holmquist GP. (1998) Endogenous lesions, S-phase-independent spontaneous mutations, and evolutionary strategies for base excision repair. Mutat Res. 400, 59–68. Akbari M, Keijzers G, Maynard S, Scheibye-Knudsen M, Desler C, Hickson ID, Bohr VA. (2014) Overexpression of DNA ligase III in mitochondria protects cells against oxidative stress and improves mitochondrial DNA base excision repair. DNA Repair 16, 44-53. Figure 1. 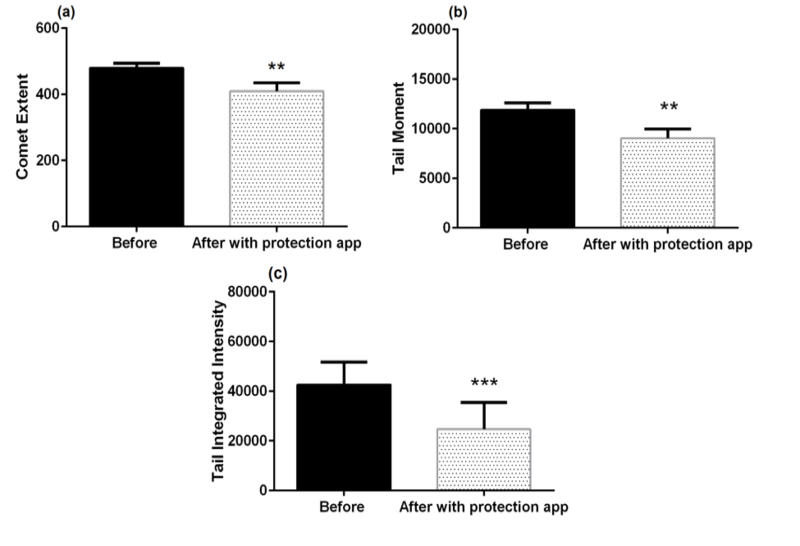 Differences in DNA damage levels as measured by (a) comet extent, (b) tail moment, and (c) tail integrated intensity (units of measurement are arbitrary) before and after cell phone use in the group with the protection application (“app”) disabled. Bars represent mean value and error bars represent the standard error of the mean (SEM) for n=10. ***p< 0.001;**** p<0.0001, compared to before exposure (paired t-test). Figure 2. 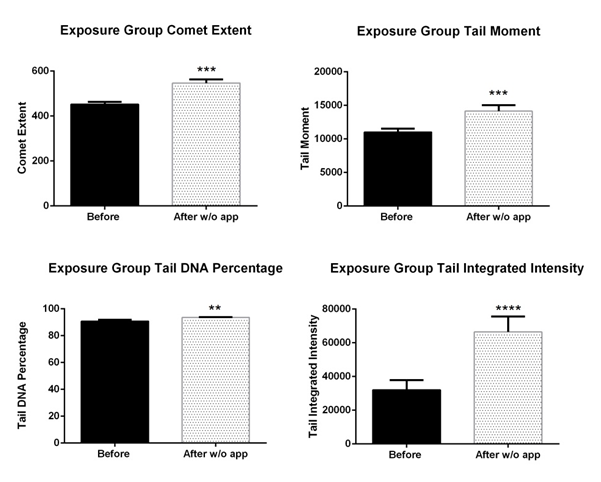 Differences in DNA damage levels as measured by (a) comet extent, (b) tail moment, and (c) tail integrated intensity (units of measurement are arbitrary) before and after cell phone use in the group with the protection application enabled. Bars represent mean value and error bars represent the standard error of the mean (SEM) for n=10. ** p<0.01; ***p< 0.001, compared to before exposure (paired t-test).